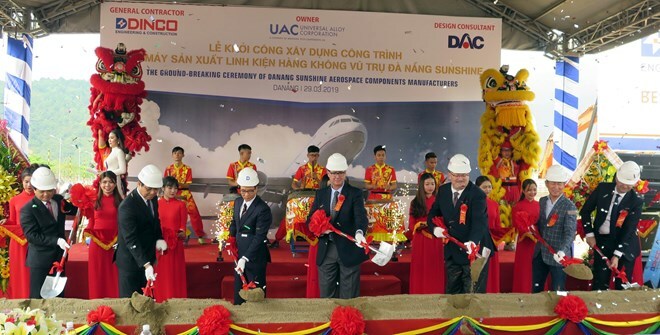 Da Nang (VNA) – The Universal Alloys Corporation ASIA PTE., LTD (UAC) and the People’s Committee of the central city of Da Nang on March 29 started the construction of an aerospace component factory in the city. The Sunshine factory, the first of its kind in Vietnam, has a registered investment of 170 million USD and aims to produce and install aerospace components from aluminum alloys and composite in service of the industry. It will turn out about 4,000 out of the 5 million aircraft components, all for export. The factory is scheduled to achieve an export value of 25 million USD in 2021, about 85 million USD a year later and over 180 million USD annually after 2026. To operate the factory, the UAC will employ about 1,200 high-quality workers in the fields of mechanics, automation and electricity. Besides, it will develop a chain of satellite enterprises, thus indirectly creating jobs for another 2,000 workhands. Speaking at the ceremony to start the construction, UAC CEO Kevin Loebbaka expressed his hope that the Da Nang factory will develop unceasingly and play an important role in the strategy of providing components to its partners worldwide.